Citation: Naveenkumar,N.,Selvavinayagam,G. (2015). Mining Techniques for Clinical Expert System and Predicting and Treating Lung Cancer with Big Data. 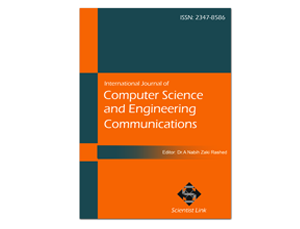 International Journal of Computer Science and Engineering Communications,Vol.3,Issue.3,pp.1040-1046. Cancer is the very most important cause of death for both Men and Women. The early apprehension and treatment of cancer can be helpful in curing the disease completely. So the obligation of techniques to detect the state of cancer nodule in early stage increasing. A disease that is commonly misdiagnosed is Lung Cancer. Earlier diagnosis of Lung Cancer saves massive lives, flaw which may lead to other harsh problems causing sudden fatal end detection and diagnosis of the disease. Its treat rate and prediction depends mainly on the early detection and diagnosis sudden fatal end. Data mining have found numerous applications in business and methodical domain. Valuable information can be discovered from application of data mining techniques in healthcare system. In this study, we momentarily examine the potential use of classification based data mining techniques in healthcare system. Big data collects the huge amounts of healthcare data set and survey many data mining approaches for predicting the likelihood of patients getting a Lung Cancer disease. Aim of the paper is to suggest a model for early detection and correct diagnosis of the disease using which will help the doctor in saving the life of the patient. Keywords: Lung Cancer, Data Mining, Big data, Healthcare. Lung cancer is cancer that begins in the Lungs. It is the second most familiar cancer in men and women, as well as the important cause of cancer death in both men and women. There are two main types of lung cancer. They are non-small cell lung cancer and small cell lung cancer. A doctor called a pathologist uses a microscope to look at the cancer cells collected during your biopsy to tell which type of cancer you have. These two types of lung cancer generate and spread in different ways. Therefore, they are treated differently. Non-small cell lung cancer usually grows and spreads more progressively than small cell lung cancer. About 85% to 90% of lung cancers are non-small cell. There are three main types of NSCLC. While there are slight differences between them, they tend to have a parallel prediction (outlook) and are usually treated the same way:  Adenocarcinoma. This is the most regular kind of non-small cell lung cancer. And it's the most common type of lung tumor in nonsmokers. It tends to grow in the outer limits of your lungs, and usually grows more slowly than other types of lung cancer.  Squamous cell carcinoma (epidermoid carcinoma). This type of non-small cell lung cancer develops more often in smokers. These cancers tend to found in the middle part of the lungs.  Large cell. This is the least frequent of the three kinds of non-small cell lung cancer. It tends to grow and widen early to other organs, which can make it harder to treat. G.Parthiban, A.Rajesh, S.K.Srivasta, IJCA, Volume 24, No-3, June-2011, Diagnosis of Heart Disease for Diabetic Patients using Naive Bayes Method. Dhanashree S. Medhekar, Mayur P. Bote, Shruti D. Deshmukh, IJERSTE, Vol. 2 issue 3, March.-2013 Issn no: 2319-7463,Heart Disease Prediction System using Naive Bayes. Shweta Kharya, IJCSEIT, Vol.2, No.2, April 2012, Using Data Mining Techniques For Diagnosis And Prognosis Of Cancer Disease. Divya Jain, Sumanlata Gautam, IJRDTM, Volume – 21, Issue 2, ISBN - 1-63102-446-9, June 2014,Study of data mining classification techniques in health care sector. Sellappan Palaniappan, Rafiah Awang, IJCSNS, VOL.8 No.8, August 2008, Intelligent Heart Disease Prediction System Using Data Mining Techniques. M. Durairaj, V. Ranjani, IJSTR, Volume 2, Issue 10, October 2013 Issn 2277-8616, Data Mining Applications In Healthcare Sector: A Study. V.Krishnaiah,Dr.G.Narsimha,Dr.N.Subhash Chandra, IJCSIT , Vol. 4 (1) , 2013, 39 – 45, Diagnosis of Lung Cancer Prediction System Using Data Mining Classification Techniques. Ms. Vibhavari Chavan, Prof. Rajesh. N. Phursule, IJCSIT, Vol. 5 (6) , 2014, 7932-7939, Survey Paper On Big Data. N. Aditya Sundar, P. Pushpa Latha, M. Rama Chandra, IJESAT, Volume-2, Issue-3, 470 – 478, Performance Analysis Of Classification Data Mining Techniques Over Heart Disease Data Base. N. Abirami, T. Kamalakannan, Dr. A. Muthukumaravel, IJETAE, Volume 3, Issue 7, July 2013, A Study on Analysis of Various Datamining Classification Techniques on Healthcare Data.